This article is about the Kingdom of Tonga. For other uses, see Tonga (disambiguation). 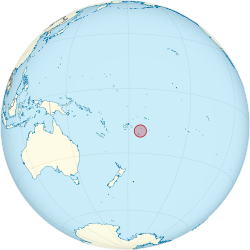 Tonga (/ˈtɒŋ(ɡ)ə/; Tongan: [ˈtoŋa] Puleʻanga Fakatuʻi ʻo Tonga), officially the Kingdom of Tonga, is a Polynesian country and archipelago comprising 169 islands, of which 36 are inhabited. The total surface area is about 750 square kilometres (290 sq mi) scattered over 700,000 square kilometres (270,000 sq mi) of the southern Pacific Ocean. The sovereign state has a population of 100,651 people, of whom 70% reside on the main island of Tongatapu. Tonga stretches across approximately 800 kilometres (500 mi) in a north-south line. It is surrounded by Fiji and Wallis and Futuna (France) to the northwest, Samoa to the northeast, Niue to the east (which is the nearest foreign territory), Kermadec (part of New Zealand) to the southwest, and New Caledonia (France) and Vanuatu to the farther west. It is about 1,800 kilometres (1,100 mi) from New Zealand's North Island. In many Polynesian languages, including Tongan, the word tonga comes from fakatonga which means "southwards", as the archipelago is the southernmost group of the islands of central Polynesia. The word tonga is cognate to the Hawaiian region of Kona, meaning leeward in the Hawaiian language. An Austronesian-speaking group linked to the archaeological construct known as the Lapita cultural complex reached and inhabited Tonga around 1500–1000 BC. Scholars have much debated the exact dates of the initial settlement of Tonga, but Thorium dating confirms that the first settlers came to the oldest town, Nukuleka, by 888 BC, ± 8 years. Not much is known before European contact because of the lack of a writing system, but oral history has survived and been recorded after the arrival of the Europeans. By the 12th century, Tongans and the Tongan paramount chief, the Tuʻi Tonga, had a reputation across the central Pacific—from Niue, Samoa, Rotuma, Wallis & Futuna, New Caledonia to Tikopia—leading some historians to speak of a Tuʻi Tonga Empire. In the 15th century and again in the 17th, civil war erupted. The Tongan people first encountered Europeans in 1616 when the Dutch vessel Eendracht, captained by Willem Schouten, made a short visit to trade. Later came other Dutch explorers, including Jacob Le Maire (who called on the northern island of Niuatoputapu); and in 1643 Abel Tasman (who visited Tongatapu and Haʻapai). Later noteworthy European visitors included James Cook (Royal Navy) in 1773, 1774, and 1777; Spanish Navy explorers Francisco Mourelle de la Rúa in 1781 and Alessandro Malaspina in 1793; the first London missionaries in 1797; and the Wesleyan Methodist Reverend Walter Lawry in 1822. The US Exploring Expedition visited in 1840. In 1845, the ambitious young warrior, strategist, and orator Tāufaʻāhau united Tonga into a kingdom. He held the chiefly title of Tuʻi Kanokupolu, but had been baptised by Methodist missionaries with the name Siaosi ("George") in 1831. 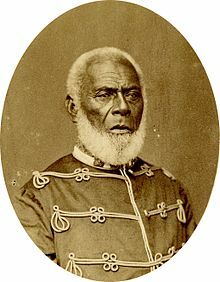 In 1875, with the help of missionary Shirley Waldemar Baker, he declared Tonga a constitutional monarchy; formally adopted the western royal style; emancipated the "serfs"; enshrined a code of law, land tenure, and freedom of the press; and limited the power of the chiefs. Tonga became a protected state under a Treaty of Friendship with Britain on 18 May 1900, when European settlers and rival Tongan chiefs tried to oust the second king. The treaty posted no higher permanent representative on Tonga than a British Consul (1901–1970). Under the protection of Britain, Tonga maintained its sovereignty, and remained the only Pacific nation to retain its monarchical government (unlike Tahiti and Hawaiʻi). The Tongan monarchy follows an uninterrupted succession of hereditary rulers from one family. The 1918 flu pandemic, brought to Tonga by a ship from New Zealand, killed 1,800 Tongans, reflecting a mortality rate of about eight per cent. The Treaty of Friendship and Tonga's protection status ended in 1970 under arrangements established by Queen Salote Tupou III prior to her death in 1965. Tonga joined the Commonwealth of Nations in 1970 (atypically as a country with its own monarch rather than that of the United Kingdom, similar to Malaysia, Lesotho, and Swaziland), and became a member of the United Nations in September 1999. While exposed to colonial pressures, Tonga has always governed itself, which makes it unique in the Pacific. As part of cost-cutting measures across the British Foreign Service, the British Government closed the British High Commission in Nukuʻalofa in March 2006, transferring representation of British interests to the High Commissioner in Fiji. The last resident British High Commissioner was Paul Nessling. Tonga is a constitutional monarchy. Reverence for the monarch replaces that held in earlier centuries for the sacred paramount chief, the Tuʻi Tonga. Criticism of the monarch is held to be contrary to Tongan culture and etiquette. King Tupou VI (a descendant of the first monarch), his family, powerful nobles and a growing non-royal elite caste live in much wealth, with the rest of the country living in relative poverty. The effects of this disparity are mitigated by education, medicine, and land tenure. Tonga provides for its citizens a free and mandatory education for all, secondary education with only nominal fees, and foreign-funded scholarships for post-secondary education. The pro-democracy movement in Tonga promotes reforms, including better representation in the Parliament for the majority of commoners, and better accountability in matters of state. An overthrow of the monarchy is not part of the movement and the institution of monarchy continues to hold popular support, even while reforms are advocated. Until recently, the governance issue was generally ignored by the leaders of other countries, but major aid donors and neighbours New Zealand and Australia are now expressing concerns about some Tongan government actions. Following the precedents of Queen Sālote and the counsel of numerous international advisors,[who?] the government of Tonga under King Tāufaʻāhau Tupou IV (reigned 1965–2006) monetised the economy, internationalised the medical and education system, and enabled access by commoners to increasing forms of material wealth (houses, cars, and other commodities), education, and overseas travel. Tongans have universal access to a national health care system. The Constitution of Tonga protects land ownership: land cannot be sold to foreigners (although it may be leased). While there is a land shortage on the urbanised main island of Tongatapu (where 70% of the population resides), there is farmland available in the outlying islands. The majority of the population engages in some form of subsistence production of food, with approximately half producing almost all of their basic food needs through farming, sea harvesting, and animal husbandry. Women and men have equal access to education and health care and are fairly equal in employment, but women are discriminated against in land holding, electoral politics, and government ministries. The previous king, Tāufaʻāhau Tupou IV, and his government made some problematic economic decisions and were accused[by whom?] of wasting millions of dollars on unwise investments. The problems have mostly been driven by attempts to increase national revenue through a variety of schemes: considering making Tonga a nuclear waste disposal site (an idea floated in the mid 1990s by the current crown prince); and selling Tongan Protected Persons Passports (which eventually forced Tonga to naturalise the purchasers, sparking ethnicity-based concerns within Tonga). Schemes also included the registering of foreign ships (which proved to be engaged in illegal activities, including shipments for al-Qaeda); claiming geo-orbital satellite slots (the revenue from which seems to belong to the Princess Royal, not the state); holding a long-term charter on an unusable Boeing 757 that was sidelined in Auckland Airport, leading to the collapse of Royal Tongan Airlines; and approving a factory for exporting cigarettes to China (against the advice of Tongan medical officials, and decades of health promotion messaging). The king proved vulnerable to speculators with big promises and lost reportedly US$26 million to Jesse Bogdonoff, a financial adviser who called himself the king's Court Jester. The police imprisoned pro-democracy leaders, and the government repeatedly confiscated the newspaper The Tongan Times (printed in New Zealand and sold in Tonga) because the editor had been vocally critical of the king's mistakes. Notably, the Keleʻa, produced specifically to critique the government and printed in Tonga by pro-democracy leader ʻAkilisi Pōhiva, was not banned during that time. Pōhiva, however, had been subjected to harassment in the form of barratry (frequent lawsuits). In mid-2003, the government passed a radical constitutional amendment to "Tonganize" the press, by licensing and limiting freedom of the press, so as to protect the image of the monarchy. The amendment was defended by the government and by royalists on the basis of traditional cultural values. Licensure criteria include 80% ownership by Tongans living in the country. As of February 2004[update], those papers denied licenses under the new act included the Taimi ʻo Tonga (Tongan Times), the Keleʻa, and the Matangi Tonga—while those permitted licenses were uniformly church-based or pro-government. The bill was opposed in the form of a several-thousand-strong protest march in the capital, a call by the Tuʻi Pelehake (a prince, nephew of the king and elected member of parliament) for Australia and other nations to pressure the Tongan government to democratise the electoral system, and a legal writ calling for a judicial investigation of the bill. The latter was supported by some 160 signatures, including seven of the nine elected, "People's Representatives". The then Crown Prince Tupoutoʻa and Pilolevu, the Princess Royal, remained generally silent on the issue. In total, the changes threatened to destabilise the polity, fragment support for the status quo, and place further pressure on the monarchy. In 2005, the government spent several weeks negotiating with striking civil-service workers before reaching a settlement. The civil unrest that ensued was not limited to Tonga; protests outside the King's New Zealand residence made headlines. Prime Minister Prince ʻAhoʻeitu ʻUnuakiʻotonga Tukuʻaho (Lavaka Ata ʻUlukālala) (now King Tupou VI) resigned suddenly on 11 February 2006, and also gave up his other cabinet portfolios. The elected Minister of Labour, Dr Feleti Sevele, replaced him in the interim. On 5 July 2006, a driver in Menlo Park, California caused the deaths of Prince Tuʻipelehake ʻUluvalu, his wife, and their driver. Tuʻipelehake, 55, was the co-chairman of the constitutional reform commission, and a nephew of the King. The public expected some changes when George Tupou V succeeded his father in September 2006. 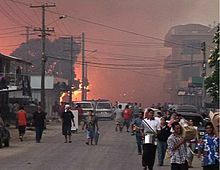 On 16 November 2006, rioting broke out in the capital city of Nukuʻalofa when it seemed that the parliament would adjourn for the year without having made any advances in increasing democracy in government. Pro-democracy activists burned and looted shops, offices, and government buildings. As a result, more than 60% of the downtown area was destroyed, and as many as 6 people died. The disturbances were ended by action from Tongan Security Forces and troops from New Zealand-led Joint Task Force. On 29 July 2008, the Palace announced that King George Tupou V would relinquish much of his power and would surrender his role in day-to-day governmental affairs to the Prime Minister. The royal chamberlain said that this was being done to prepare the monarchy for 2010, when most of the first parliament will be elected, and added: "The Sovereign of the only Polynesian kingdom... is voluntarily surrendering his powers to meet the democratic aspirations of many of his people." The previous week, the government said the king had sold state assets that had contributed to much of the royal family's wealth. 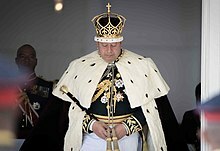 On 15 March 2012, King George Tupou V contracted pneumonia and was brought to Queen Mary Hospital in Hong Kong. He was later diagnosed with leukaemia. His health deteriorated significantly shortly thereafter, and he died at 3:15 pm on 18 March 2012. He was succeeded by his brother Tupou VI, who was crowned on 4 July 2015. Tonga's foreign policy as of January 2009[update] has been described by Matangi Tonga as "Look East"—specifically, as establishing closer diplomatic and economic relations with Asia (which actually lies to the north-west of the Pacific kingdom). Tonga retains cordial relations with the United States. 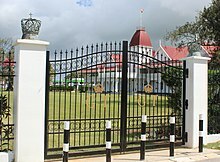 Although it remains on good terms with the United Kingdom, the two countries do not maintain particularly close relations, and the United Kingdom closed its High Commission in Tonga in 2006. Tonga's relations with Oceania's regional powers, Australia and New Zealand, are good. Tonga maintains strong regional ties in the Pacific. It is a full member of the Pacific Islands Forum, the South Pacific Applied Geoscience Commission, the South Pacific Tourism Organisation, the Pacific Regional Environment Programme and the Secretariat of the Pacific Community. The Tongan government supported the American "coalition of the willing" action in Iraq and deployed 40+ soldiers (as part of an American force) in late 2004. The contingent returned home on 17 December 2004. In 2007 a second contingent went to Iraq, and two more were sent during 2008 as part of continued support for the coalition. Tongan involvement concluded at the end of 2008 with no reported loss of life. In 2010, Brigadier General Tauʻaika ʻUtaʻatu, Commander of the Tonga Defence Services, signed an agreement in London committing a minimum of 200 troops to co-operate with Britain's International Security Assistance Force (ISAF) in Afghanistan. The task completed in April 2014 and the UK presented Operational Service Medals to each of the soldiers involved during a parade held in Tonga. Tonga has contributed troops and police to the Bougainville conflict in Papua-New Guinea and to the Australian-led RAMSI force in the Solomon Islands. Tonga is sub-divided into five administrative divisions: ʻEua, Haʻapai, Niuas, Tongatapu, and Vavaʻu. Located in Oceania, Tonga is an archipelago in the South Pacific Ocean, directly south of Samoa and about two-thirds of the way from Hawaii to New Zealand. Its 169 islands, 36 of them inhabited, are divided into three main groups – Vava'u, Ha'apai, and Tongatapu – and cover an 800-kilometre (500-mile)-long north-south line. The largest island, Tongatapu, on which the capital city of Nukuʻalofa is located, covers 257 square kilometres (99 sq mi). Geologically the Tongan islands are of two types: most have a limestone base formed from uplifted coral formations; others consist of limestone overlaying a volcanic base. The climate is tropical with a distinct warm period (December–April), during which the temperatures rise above 32 °C (89.6 °F), and a cooler period (May–November), with temperatures rarely rising above 27 °C (80.6 °F). The temperature increases from 23 to 27 °C (73.4 to 80.6 °F), and the annual rainfall is from 1,700 to 2,970 millimetres (66.9 to 116.9 inches) as one moves from Tongatapu in the south to the more northerly islands closer to the Equator. The average wettest period is around March with on average 263 mm (10.4 in). The average daily humidity is 80%. The highest temperature recorded in Tonga was 35 °C (95 °F) on 11 February 1979 in Vava'u. The coldest temperature recorded in Tonga was 8.7 °C (47.7 °F) on 8 September 1994 in Fua'amotu. Temperatures of 15 °C (59 °F) or lower are usually measured in the dry season and are more frequent in southern Tonga than in the north of the island. The tropical cyclone season currently runs from 1 November to 30 April, though tropical cyclones can form and affect Tonga outside of the season. In Tonga, dating back to Tongan legend, flying bats are considered sacred and are the property of the monarchy. Thus they are protected and can not be harmed or hunted. As a result, flying fox bats have thrived in many of the islands of Tonga. Tonga's economy is characterised by a large non-monetary sector and a heavy dependence on remittances from the half of the country's population who live abroad (chiefly in Australia, New Zealand and the United States). The royal family and the nobles dominate and largely own the monetary sector of the economy – particularly the telecommunications and satellite services. Tonga was named the sixth most corrupt country in the world by Forbes magazine in 2008. The manufacturing sector consists of handicrafts and a few other very small scale industries, which contribute only about 3% of GDP. Commercial business activities also are inconspicuous and, to a large extent, are dominated by the same large trading companies found throughout the South Pacific. 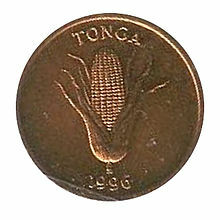 In September 1974, the country's first commercial trading bank, the Bank of Tonga, opened. Tonga's development plans emphasise a growing private sector, upgrading agricultural productivity, revitalising the squash and vanilla bean industries, developing tourism, and improving communications and transport. Substantial progress has been made, but much work remains to be done. A small but growing construction sector is developing in response to the inflow of aid monies and remittances from Tongans abroad. In recognition of such a crucial contribution the present government has created a new department within the Prime Minister's Office with the sole purpose of catering for the needs of Tongans living abroad. Furthermore, in 2007 the Tongan Parliament amended citizenship laws to allow Tongans to hold dual citizenship. The tourist industry is relatively undeveloped; however, the government recognises that tourism can play a major role in economic development, and efforts are being made to increase this source of revenue. Cruise ships often stop in Vavaʻu, which has a reputation for its whale watching, game fishing, surfing, beaches and is increasingly becoming a major player in the South Pacific tourism market. Tonga's postage stamps, which feature colourful and often unusual designs (including heart-shaped and banana-shaped stamps), are popular with philatelists around the world. In 2005, the country became eligible to become a member of the World Trade Organization. After an initial voluntary delay, Tonga became a full member of the WTO on 27 July 2007. The Tonga Chamber of Commerce and Industry (TCCI), incorporated in 1996, endeavours to represent the interests of its members, private sector businesses, and to promote economic growth in the Kingdom. Tonga is home to some 106,000 people, but more than double that number live overseas, mainly in the US, New Zealand and Australia. Remittances from the overseas population has been declining since the onset of the 2008 global economic crisis. The tourism industry is improving, but remains modest at under 90,000 tourists per year. In Tonga, agriculture and forestry (together with fisheries) provide the majority of employment, foreign exchange earnings and food. Rural Tongans rely on both plantation and subsistence agriculture. Plants grown for both market cash crops and home use include bananas, coconuts, coffee beans, vanilla beans, and root crops such as cassava, sweet potato and taro. As of 2001[update], two-thirds of agricultural land was in root crops. The processing of coconuts into copra and desiccated (dried) coconut was once the only significant industry, and only commercial export, but deteriorating prices on the world market and lack of replanting brought this once vibrant industry, as in most island nations of the South Pacific, to a complete standstill. Pigs and poultry are the major types of livestock. Horses are kept for draft purposes, primarily by farmers working their ʻapi ʻuta (a plot of bushland). More cattle are being raised, and beef imports are declining. The traditional feudal land ownership system meant that farmers had no incentive to invest in planting long-term tree crops on land they did not own, but in the late twentieth century kava and vanilla from larger plantations became the main agricultural exports, together with squash. The export of squash to Japan, beginning in 1987, once brought relief to Tonga's struggling economy, but local farmers became increasingly wary of the Japanese market due to price fluctuations, not to mention the huge financial risks involved. Tonga has begun implementing tailor-made policies to power its remote islands in a sustainable way without turning to expensive grid-extensions. A number of islands lack a basic electricity supply, a supply entirely coming from imported diesel: in 2009, 19% of GDP and 25% of imports consisted of diesel. In view of the decreasing reliability of fossil-fuel electricity generation, its increasing costs and negative environmental side-effects, renewable energy solutions have attracted the government's attention. Together with IRENA, Tonga has charted out a renewable energy based strategy to power the main and outer islands alike. The strategy focuses on Solar Home Systems that turn individual households into small power plants. In addition, it calls for the involvement of local operators, finance institutions and technicians to provide sustainable business models as well as strategies to ensure the effective operation, management and maintenance once the systems are installed. With the assistance of IRENA, Tonga has developed the 2010–2020 Tonga Energy Road Map (TERM), which aims for a 50% reduction of diesel importation. This will be accomplished through a range of appropriate renewable technologies, including wind and solar, as well as innovative efficiencies. Over 70% of the 107,122 inhabitants live on its main island, Tongatapu. Although an increasing number of Tongans have moved into the only urban and commercial centre, Nukuʻalofa, where European and indigenous cultural and living patterns have blended, village life and kinship ties remain influential throughout the country. Despite emigration, Tonga grew in population from about 32,000 in the 1930s to more than 90,000 by 1976. According to the government portal, Tongans, Polynesian by ethnicity with a mixture of Melanesian, represent more than 98% of the inhabitants. 1.5% are mixed Tongans and the rest are European (the majority are British), mixed European, and other Pacific Islanders. In 2001 there were approximately 3,000 or 4,000 Chinese in Tonga, comprising 3 or 4% of the total Tongan population. In 2006, Nukuʻalofa riots mainly targeted Chinese-owned businesses, leading to the emigration of several hundred Chinese so that only about 300 remain. The Tongan language is the official language, along with English. Tongan, a Polynesian language, is closely related to Wallisian (Uvean), Niuean, Hawaiian, and Samoan. Tonga does not have an official state religion.. The Constitution of Tonga (Revised 1998) provides for freedom of religion. In 1928, Queen Salote Tupou III, who was a member of the Free Wesleyan Church of Tonga, established the Free Wesleyan Church as the state religion of Tonga. The chief pastor of the Free Wesleyan Church serves as the representative of the people of Tonga and of the Church at the coronation of a King or Queen of Tonga where he anoints and crowns the Monarch. In opposition to the establishment of the Free Wesleyan Church as a state religion, the Church of Tonga separated from the Free Wesleyan Church in 1928. The Church of Jesus Christ of Latter-day Saints sent missionaries in 1891 to visit King Siaosi (George) Tupo where they obtained permission to preach. By some published surveys, Tonga has one of the highest obesity rates in the world. World Health Organization data published in 2014 indicates that Tonga stands 4th overall in terms of countries listed by mean body mass index data. In 2011, 90% of the adult population were considered overweight using NIH interpretation of body mass index (BMI) data, with more than 60% of those obese. 70% of Tongan women aged 15–85 are obese. Tonga and nearby Nauru have the world's highest overweight and obese populations. Obesity is common, as on many Pacific islands. Tongans enjoy a relatively high level of education, with a 98.9% literacy rate, and higher education up to and including medical and graduate degrees (pursued mostly overseas). Humans have lived in Tonga for nearly 3,000 years, since settlement in late Lapita times. Before the arrival of European explorers in the late 17th and early 18th centuries, Tongans had frequent contacts with their nearest oceanic neighbours, Fiji and Niue. In the 19th century, with the arrival of Western traders and missionaries, Tongan culture changed, especially in religion. As of 2013[update], almost 98 percent of residents profess Christianity. The people discarded some old beliefs and habits and adopted others. Contemporary Tongans often have strong ties to overseas lands. Many Tongans have emigrated to Australia, New Zealand, or the United States to seek employment and a higher standard of living. The United States is the preferred destination for Tongan emigrants, and as of 2000 there were 36,840 Tongans living in the US. More than 8,000 Tongans live in Australia. The Tongan diaspora retains close ties to relatives at home, and a significant portion of Tonga's income derives from remittances to family members (often aged) who prefer to remain in Tonga. Rugby union is the national sport, and the national team (ʻIkale Tahi, or Sea Eagles) has performed quite well on the international stage. Tonga has competed in six Rugby World Cups since 1987. The 2007 and 2011 Rugby World Cups were Tonga's most successful to date, both winning two out of four matches and in a running chance for the quarter finals. In the 2007 Rugby World Cup, Tonga won its first two matches, against the USA 25–15, and Samoa 19–15. They came very close to upsetting the eventual winners of the 2007 tournament, the South African Springboks, losing 30–25. A loss to England, 36–20 in their last pool game ended their hopes of making the knockout stages. Nevertheless, by picking up third place in their pool games behind South Africa and England, Tonga earned automatic qualification for the 2011 Rugby World Cup in New Zealand. In Pool A of the 2011 Rugby World Cup, Tonga beat both Japan 31–18 and 5th ranked eventual finalist France 19–14 in the latter pool stages. However, a previous heavy defeat to the All Blacks at the tournament's opener (41–10) and a subsequent tight loss to Canada (25–20) meant that Tonga lost out to France (who also lost to NZ) for the quarter finals due to 2 bonus points and a points difference of 46. Tonga's best result before 2007 came in 1995, when they beat Côte d'Ivoire 29–11, and 1999 when they beat Italy 28–25 (although with only 14 men they lost heavily to England, 101–10). 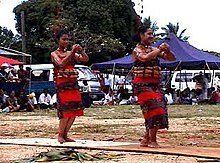 Tonga perform the Ikale Tahi war dance or Sipi Tau (a form of Kailao) before all their matches. Tonga used to compete in the Pacific Tri-Nations against Samoa and Fiji, which has now been replaced by the IRB Pacific Nations Cup, which now involves Japan, Canada, and the United States. At club level, there are the Datec Cup Provincial Championship and the Pacific Rugby Cup. Rugby union is governed by the Tonga Rugby Football Union, which was a member of the Pacific Islands Rugby Alliance and contributed to the Pacific Islanders rugby union team, before they were disbanded in 2009. Many players of Tongan descent – e.g., Jonah Lomu, Israel Folau, Viliami "William" ʻOfahengaue, Malakai Fekitoa, Ben Afeaki, Charles Piutau, Frank Halai, Sekope Kepu, George Smith, Wycliff Palu, Sitaleki Timani, Salesi Ma'afu, Anthony and Saia Faingaa, Mark Gerrard, Cooper Vuna, Doug Howlett, Toutai Kefu and Tatafu Polota-Nau – have played for either the All Blacks or the Wallabies. British and Irish Lion and Welsh international player Taulupe "Toby" Faletau is Tongan born and the son of Tongan international Kuli Faletau. Taulupe's cousins and England international players Billy and Mako Vunipola (who is also a British and Irish Lion), are sons of former Tonga rugby captain Fe'ao Vunipola. Rugby is popular among the nation's schools, and students from schools such as Tonga College and Tupou College are regularly offered scholarships in New Zealand, Australia and Japan. Rugby league has gained some success. In the 2008 Rugby League World Cup Tonga recorded wins against Ireland and Scotland. In the 2017 World Cup, the Tonga side beat New Zealand in Hamilton at Waikato Stadium on 11 November. In doing so, Tonga became the first national side in the history of the sport (outside of the big three nations of Australia, New Zealand and England/Great Britain) to beat one of the big three nations. In addition to the success of the national team, many players of Tongan descent make it big in the Australian National Rugby League competition. These include Willie Mason, Manu Vatuvei, Brent Kite, Willie Tonga, Anthony Tupou, Antonio Kaufusi, Israel Folau, Taniela Tuiaki, Michael Jennings, Tony Williams, Feleti Mateo, Fetuli Talanoa, to name a few. Subsequently, some Tongan rugby league players have established successful careers in the Super League such as Antonio Kaufusi. Aside from rugby, Tonga has also produced athletes who have competed at both the Summer and Winter Olympics. Tonga's only Olympic medal came from the 1996 Summer Olympics in Atlanta, where Paea Wolfgramm won silver in Super heavyweight boxing. One athlete attended the 2018 Winter Olympics in Pyeongchang, South Korea. ^ a b c "The World Factbook: Tonga: Geography". Retrieved 16 November 2018. 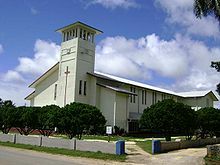 ^ Free Wesleyan Church of Tonga is the officially established church. See Religion section in this article for more details. ^ . Tonga 2016 Census Results (11 November 2016). ^ "Human Development Report 2015" (PDF). United Nations. 2015. Retrieved 15 December 2015. ^ Mariner, William and Martin, John (1817). An account of the natives of the Tonga islands in the south Pacific Ocean: With an original grammar and vocabulary of their language. Compiled and arranged from the extensive communications of Mr. William Mariner, several years' resident in those islands, Volume 2, pp. 64–65. Retrieved 3 November 2010. ^ Tonga: History. The Commonwealth. ^ "Search | English - Tongan Translator". www.tongantranslator.com. Retrieved 29 April 2018. ^ Jolliffe, Lee, ed. (2010). Coffee Culture, Destinations and Tourism. Channel View Publications. p. 112. ISBN 9781845411923. ^ Kirch, Patrick Vinton (1997) The Lapita Peoples, Wiley, ISBN 1-57718-036-4. ^ Burley, David (2012). "High precision U/Th dating of first Polynesian settlement". PLoS One. 7 (11). doi:10.1371/journal.pone.0048769. ^ Stanton, William (1975). The Great United States Exploring Expedition. Berkeley: University of California Press. p. 186. ISBN 978-0520025578. ^ Kohn, George C. (2008). Encyclopedia of plague and pestilence: from ancient times to the present. Infobase Publishing. p. 363. ISBN 978-0-8160-6935-4. ^ "The Sun Finally Sets on Our Men in Paradise"; The Daily Telegraph; article of 21 March 2005; retrieved August 2016. 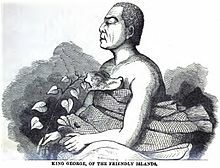 ^ "King George, of the Friendly Islands" (PDF). The Wesleyan Juvenile Offering: A Miscellany of Missionary Information for Young Persons. IX: 1. 1852. Retrieved 24 February 2016. ^ "Articles:Listing Tonga". Property Tonga. Retrieved 20 September 2016. ^ Tonga's king tricked by Korean sea water to natural gas scam. michaelfield.org (December 1997). ^ "Tonga : In Depth : History". Frommers.com. Retrieved 27 June 2010. ^ "The ships that died of shame". smh.com.au. 14 January 2003. Retrieved 27 June 2010. ^ "Tongasat". Mendosa.com. 30 December 1996. Retrieved 27 June 2010. ^ iSite Interactive Limited. "No Govt Support Blamed for Airline Collapse". Islands Business. Archived from the original on 1 July 2009. Retrieved 27 June 2010. ^ "Articles:Listing Tonga". Tobacco.org. Retrieved 27 June 2010. ^ Robie, David (November 1996). "The contempt case of the 'Tongan Three'". Pacific Journalism Review. 3 (2). ^ "Tongan Court Case Over Wrongful Imprisonment Recommences – July 31, 2002". Radio NZ. 31 July 2002. Retrieved 7 September 2016. ^ "Rioting crowd leaves leaves trail of wreckage in Nuku'alofa". Matangitonga.to. 16 November 2006. Archived from the original on 9 June 2010. Retrieved 27 June 2010. ^ "ADF deployment to Tonga, 2006". 17 January 2012. Retrieved 6 September 2017. ^ "Tonga's king to cede key powers". BBC News. 29 July 2008. Retrieved 31 July 2008. ^ "蘋果日報 – 20120319 – 患血癌染肺炎　搶救數日無效湯加國王　駕崩瑪麗醫院". Appledaily News HK. 19 March 2012. Retrieved 19 March 2012. ^ "Tonga crowns King Tupou VI in lavish public coronation, parties". ABC News. 4 July 2015. ^ "Tonga's diplomatic community grows"[permanent dead link], Matangi Tonga, 12 January 2009. ^ "Tongan troops to work with UK and other ISAF forces in Afghanistan". Ministry of Defence. 22 September 2010. Retrieved 1 June 2012. ^ "Climate Guides – Plan Your Ideal Holiday Trip". Weather2Travel. Retrieved 17 August 2012. ^ "Weatherbase: Historical Weather for Nukuʻalofa, Tonga". weatherbase.com. ^ Grant, Gilbert S. (1996). "Kingdom of Tonga: Safe Haven for Flying Foxes". Bat Conservation International. 14 (2). Retrieved 13 October 2016. ^ "About Tonga: Tongan Bats". Tonga Charter. Retrieved 12 October 2016. ^ "In Pictures: The World's Most Corrupt Countries". Forbes Magazine. 25 June 2008. Retrieved 10 August 2010. ^ "Euromoney Country Risk". Euromoney Institutional Investor PLC. Retrieved 15 August 2011. ^ a b c Ellicott, Karen, ed. (2006). Countries of the world and their leaders yearbook 2007. Farmington Hills, MI: Thomson Gale. p. 1873. ISBN 978-0-7876-8103-6. ^ Background Note: Tonga, US Department of State, 31 October 2011. ^ Hinz, Earl R. & Howard, Jim (2006). Landfalls of Paradise: Cruising Guide to the Pacific Islands. University of Hawaii Press. p. 157. ISBN 978-0-8248-3037-3. ^ "Paradise Lost, Tonga Mired in Poverty". Jakarta Globe. 18 April 2012. Archived from the original on 4 February 2013. ^ "International Renewable Energy Agency". IRENA. 26 January 2009. Retrieved 27 June 2010. ^ "Tonga Energy Press Release: IRENA signing, a milestone for Tonga's renewable energy plans". Tonga-energy.to. 24 June 2010. Archived from the original on 14 May 2011. Retrieved 1 June 2012. ^ "Tonga 2011 Census of Population and Housing". Table G17. Archived from the original on 5 February 2014. ^ Watson, Katy (18 January 2016). "How mutton flaps are killing Tonga". BBC News Online. Retrieved 25 February 2016. ^ Sands, Neil (10 April 2011) "Pacific island nations battle obesity epidemic" Archived 18 December 2013 at the Wayback Machine, Agence France-Presse. ^ "Tonga". The World Factbook. Central Intelligence Agency. Retrieved 22 June 2010. ^ Helen Morton Lee (2003). Tongans Overseas: Between Two Shores. University of Hawaii Press. ISBN 978-0-8248-2615-4. ^ "The ties that bind: stories from the Tongan diaspora". ABC. 2 May 2009. Retrieved 29 December 2014. ^ "Tonga Sport". Virtual Oceania. 26 February 2015. ^ "Official RWC 2011 Site". rugbyworldcup.com. Archived from the original on 7 January 2012. ^ "Superleague". Superleague. 8 October 2008. Archived from the original on 6 April 2012. Martin Daly (2009). Tonga: A New Bibliography. University of Hawaii Press. ISBN 978-0-8248-3196-7. Brian K. Crawford (2009). Toki: A Historical Novel. Brian K. Crawford. ISBN 978-0-557-03434-5. "Tonga". The World Factbook. Central Intelligence Agency.